My initial reaction was surprise. I never expected this move to happen now. After the Chiefs and Patriots games, sure. 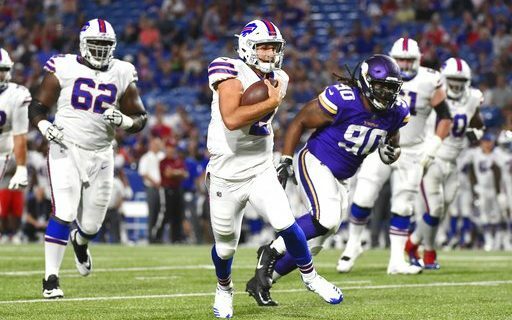 Let Peterman start at home vs. the Colts, makes sense. But after the shock wore off, I realized I shouldn’t be surprised. Everything Sean McDermott has done since he arrived in Buffalo has been done to make the Bills a better team. All of those moves haven’t been obvious on the surface, and some of them made no sense when they happened. But McDermott has not been afraid to make unpopular and even controversial roster decisions. So benching Taylor after two ugly starts is really not a surprise. Going with an untested rookie, a little surprise I guess. But McDermott is smart enough to see what everyone (except the blind Taylor loyalists) can clearly see. Taylor is not good enough. He’s too limited in his skill set, too easy to defend. Good enough to get you a win when everything works around him? Sure. But that doesn’t happen much in the NFL. Teams have figured out what the Bills do well and what they don’t do well, and Buffalo’s lack of talent has caught up to them. The fact that the team is in the playoff hunt is great. But I love what McDermott said while making the announcement. That means he isn’t content to just be in the playoff hunt or wild card spot. He wants to win a division title and Super Bowl. He knows Taylor will never get him there. I’m not sure a rookie 5th round draft pick quarterback with questionable arm strength is the guy to do it either. But we all need to find out. If not, there are plenty of draft picks to use on a signalcaller in next year’s draft. I admire McDermott’s guts in doing this. I admire that he doesn’t care what anyone thinks. The fans, the players, the media. All he cares about is one thing: Winning. To me, that’s no surprise.